This week is busy! We are going to 2 vacation Bible schools. One is in the morning and the other is in the evening. I also have a meeting at work on Wednesday afternoon, the Wee One has an activity at the local library on Thursday afternoon, and the Imaginative One has an activity at the local library on Friday afternoon. This weekend we went on a weekend getaway. The hotel we were going to be staying at didn’t provide a complimentary breakfast. We could have gone to a restaurant for breakfast but I decided it would be better if I made something for us to eat. I had made these before but had lost the recipe. As I was going through things in my house, I found the recipe and decided these would be perfect. When the Imaginative One tasted them, he fell in love with them. He kept complimenting the on how good they tasted. He also told me not to lose the recipe again. Combine flour, sugar, baking powder, salt, and nutmeg. Add milk, egg, and melted butter. Grease and flour small (mini) muffin tins. Fill 1/2 full and bake at 400 degrees fir 15 minutes or until lightly brown. Remove from the pan immediately. While the muffins are baking, melt the butter. Mix the vanilla into the butter. Combine the sugar and cinnamon. 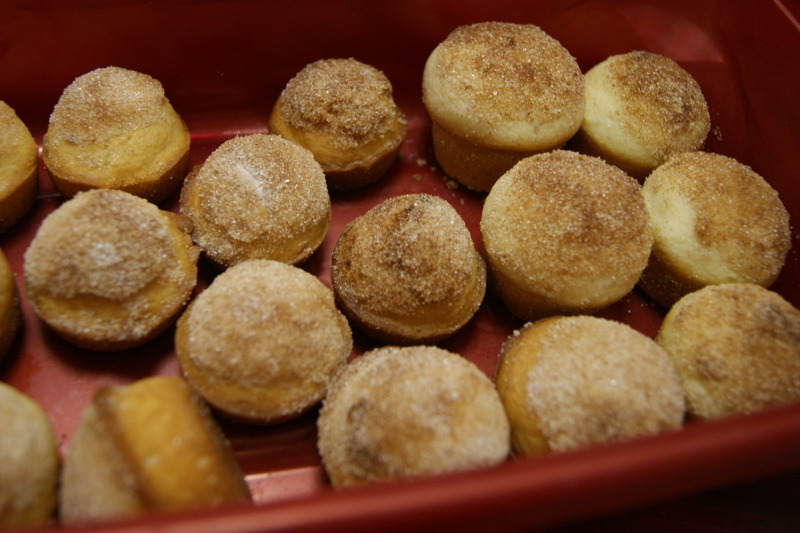 After the muffins are baked, dip in butter and then roll in the sugar-cinnamon mixture. I haven’t made a meal plan for a while. I had meal plans but they were more fluid and subject to change so I didn’t post them. This week I have a definite plan in mind.